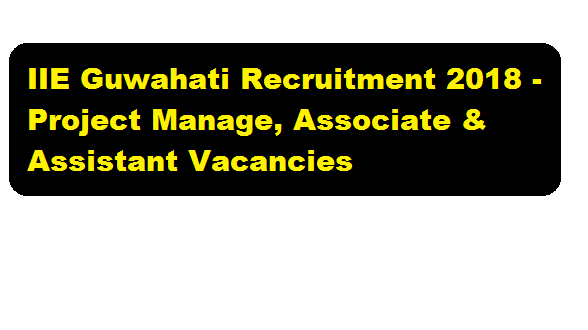 IIE Guwahati Recruitment 2018 | Project Manager, Associate & Assistant Jobs :- Hello dear Job aspirants. The Indian Institute of Entrepreneurship (IIE), Guwahati has published a Recruitment notification in the month of July 2018 and in this article we will going to talk about it. Indian Institute of Entrepreneurship (IIE), Guwahati an autonomous organization under Ministry of Skill Development and Entrepreneurship (MSDE), Govt. Of India . According to the latest IIE Guwahati Recruitment 2018, Indian Institute of Entrepreneurship (IIE), Guwahati invites applications for the following post on contractual basis for its Social Institution Building Cell (SIBC) at IIE. In this section, we will discuss in detail about Recruitment of various post under IIE Guwahati Recruitment 2018 with all the details and requirement. Selection Process : Candidates will be selected on the basis of Personal interview. Expenses of selection: No TA/DA will be provided for attending interview. Place of Interview: Interview will be held at Indian Institute of Entrepreneurship, Lalmati, Guwahati, 29.
i) Only short listed candidates will be called for the interview. ii) Date of Interview will be informed later through mail or phone call. iii) Candidate may appear in the interview along with the original testimonials and two passport size photographs. Interested candidates who want to apply IIE Guwahati recruitment 2018 must send their Application clearly mentioned about the post applied for along with the Bio-Data through email (director@iie.gov.in) or they may submit the same in the IIE office on or before 10-08-2018.